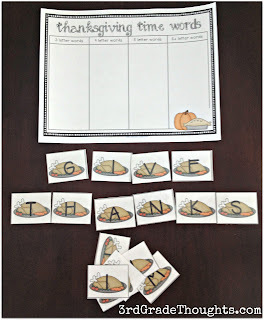 How do you all celebrate this Thanksgiving season in class? I know there are multiple ways to approach the holiday, from both historical and present-day viewpoints, or even a mixture of both. My favorite way to celebrate Thanksgiving is always from a gratitude perspective. We will talk a bit about the history, but I have always loved celebrating current-day traditions, families, food (of course!) and all of the many reasons we can be thankful this time of year. 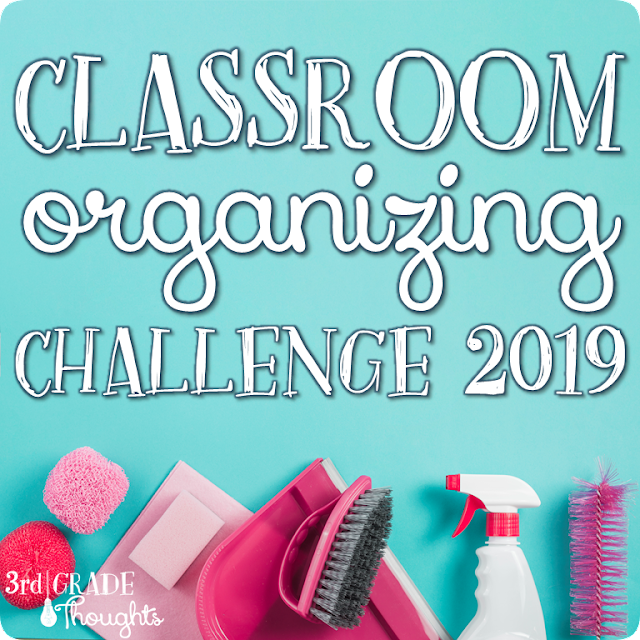 If you've used any of my centers in the past, you will notice a similar set-up, which I have found to be so beneficial for my kids throughout the entire year. 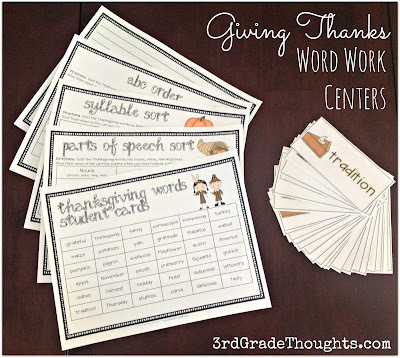 This packet includes 36 Thanksgiving-themed words that are a great way to learn and review familiar (and not-so-familiar) terms associated with this time of year. Students can either use the word cards (pictured on the right) or the individual sheet with all words to cut up and glue or just to use as reference throughout the packet. Teacher Tip: 36 words can be a *lot* of words, so for some of my strugglers, I will cut that number way down. Do you have a subscription to BrainPOP or BrainPOP, Jr? I'm lucky that our district has a license, so I can (and do!) 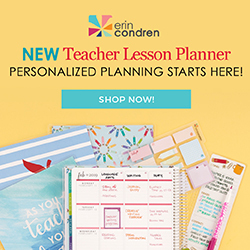 access it for just about everything! There is a *great* Cause & Effect video on BrainPop, Jr. that is a quick and effective way to launch this center if this is new to your group. 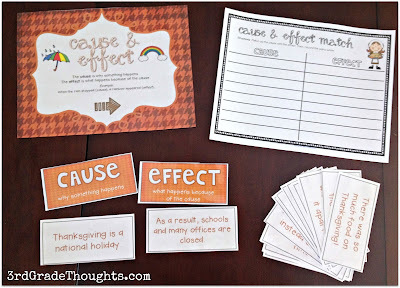 I hope these can help in your own classroom as you celebrate this season of thanks and gratitude! If you're interested, they are now in my TpT Store HERE. Do you have an old post with a schedule of your typical day? I love your centers but I would love to know how much time you give to them each day/week. How long you give for each one and do you rotate them that day or the next day. A schedule would be lovely to see. I'm a BIG fan of your blog. Thanks for all you do and share! You're so sweet, Betsy, thanks! 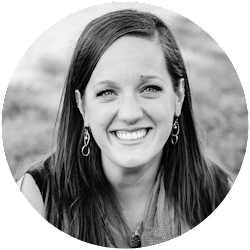 I have my kids rotate through their Daily 5 choices about twice a week for about 20-25 minutes each time. So, they end up getting about 45 minutes of Word Work each week, which works out pretty well for the activities I've included. I have all of your centers! Thanks for all your hard work. I have a question about how you limit the words for your low babies. Do you just tell them to do fewer words or do you cross some of them out on their word lists? One more question. When you first start your writer's workshop, what do you have your groups do for independent writing before they have been to teacher time? Great questions, Madeline! For my lower kids, I will use the student page and cut out a few rows for them, or a few columns. That way, they are only working with 12 words or so. Since they are all mixed up on the student page, they get a nice variety in each center. I have also had them use all 36 words but do 12 different words in each of the three centers, so they end up using all words over the course of the unit. I hope that makes sense! For your writing question, I have them free-write about anything they's like or they can use the tools in the Writing Ideas Bin to help spark their imagination.